Reduce the time needed to manage site content with in-line editing and reusable dynamic blocks. Design content updates, preview them live, and schedule publication without dependencies on other teams. Allow developers to focus their efforts on building unique shopping experiences that differentiate your brand. 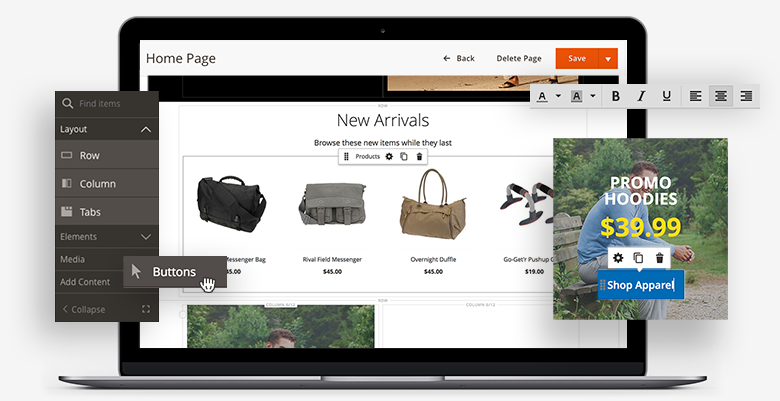 Create pages that engage shoppers with powerful content types – including images, videos, and banners – and encourage repeat visits by keeping content fresh and up-to-date with an intuitive drag-and-drop content management interface. Blend content and commerce by enriching product detail pages, quickly adding products to content pages, and improving product discovery with custom content on category pages. Marketers control how their content pages are laid out and have the ability to create without involving front-end developers. Design pages how you want with flexible content layouts then add and position elements with no code required. Customize Page Builder to create page designs that match your brand voice. Extend existing content types or create new ones from scratch to meet the content needs of your business. Demandware was slow and causing bottlenecks in their order process. Easy Spirit decided it was time for a change. Selling shoes online should be easy. Learn how to provide an omnichannel customer experience by tightly integrating your eCommerce platform with other channels that a customer might choose to engage with your company.